Wicked Awesome Adventure: 271 - Results! OK... well... I'm open to suggestions. Additionally, I suspect some ballot stuffing. Like on a massive scale. For example: how did Cad go from zero votes around noon to perfectly matching the scores of everyone else? Do Cadungery fans not get up until the crack of three, much as Cad himself would do? That's... weird. Jill and Alan seemed to be strongly contending for leadership when I last checked around 11:30 AM EST. Well, Alan can't go home without his trousers, so he and Rhys are effectively stuck together in the Haunted House for a while... I can understand if other players are tired of an explore-everything environment (even if those are my personal favorites). Perhaps you could do a 15-20 turn interlude for Jill and Cad each before returning to Rhys and Alan. Does that sound good? Jill and Alan could probably use the most development. CageyJay has a point in that there is really no reason to switch to Jill or Cad at this point. 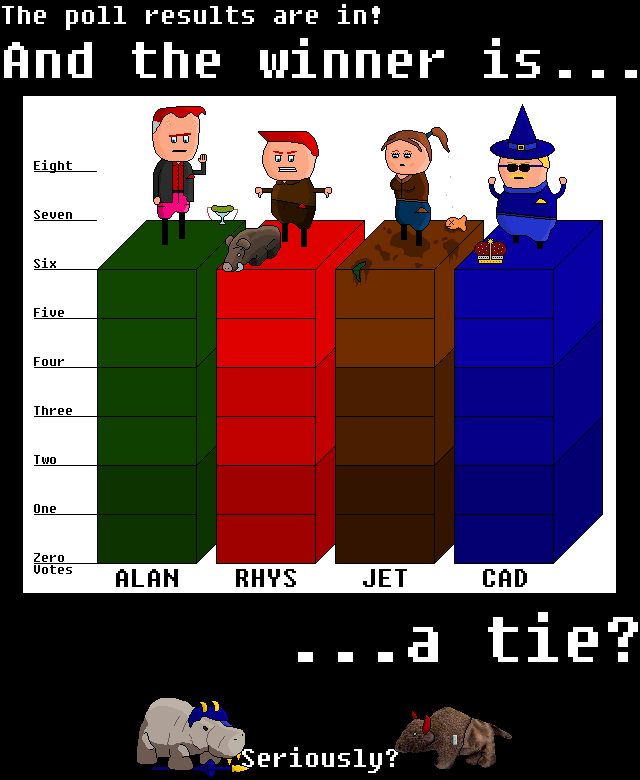 OK, so a little bit more Alan, then some Jet and Cad (and possibly wrap up the current Rhys arc along the way).